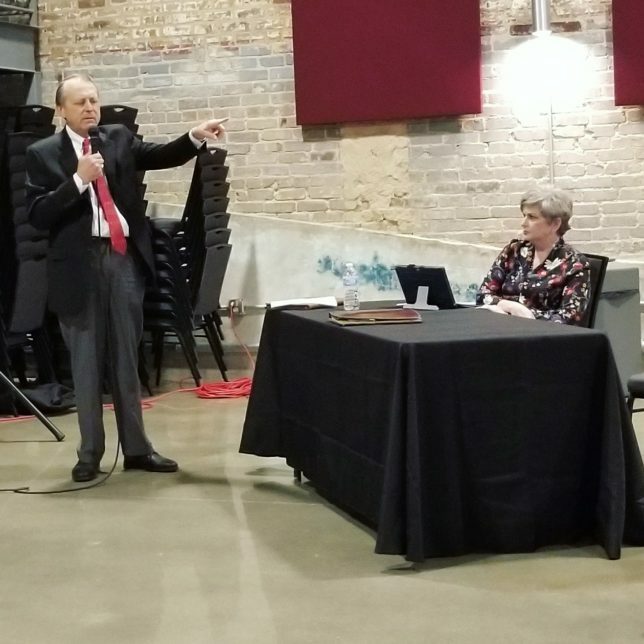 Steve Grant speaks to the Cain Center Steering Committee Thursday while Public Relations Chairwoman Darlene Forshage looks on. The symbolism was hard to miss as Steve Grant stood in front of the group Thursday night. Folks munched on food provided by the Athens High School culinary program while Grant spoke through a sound system furnished by Trinity Valley Community College in The Texan, which was provided by the City. It was the first joint meeting of the Cain Center Steering Committee and it happened through the combined effort of multiple individuals and entities, just like the ultimate work of the group will include a chorus of voices. “In our minds, it is going to take the whole community to be a part of it,” Grant said. This group — now being called the Steering Committee — was called into being by the Athens City Council last November when council members decided to allow Grant and a group of community members and activists until April 2 to come up with a viable plan for saving the Cain Center. A May referendum on the money already borrowed for the Cain Center has added to the sense of urgency on the issue. Which means a lot of organizational work was going on behind the scenes before Thursday’s big meeting. “It’s like building a house. You don’t bring the walls up until you build the foundation and that’s exactly what we’ve been doing the last 60 days,” said Grant. Each subcommittee will hold its own meetings and the whole group will come together at times when needed. Grant has been adamant that the process be transparent and that the public is a part of the process.